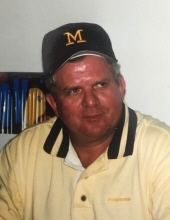 LaVern “Tump” Dingman, age 74, passed away Tuesday, January 29, 2019 at Hurley Medical Center in Flint after a long battle with Parkinson’s Disease and Cancer. Funeral services will be held at 1:00 pm Friday, February 1, 2019 at Watkins Brothers Funeral Homes, Durand Chapel. Dave Fiebernitz will officiate with a private family burial to follow. Family will receive friends at the funeral home Thursday from 4-8 pm and again Friday one hour prior to the service. Tump was born December 20, 1944 in Sheridan, Michigan to the late Richard and Esther (Snell) Dingman. He attended Durand High School, graduating in 1963. Following graduation, Tump went to work at Buick City for 36 years as a Quality Control Foreman, retiring in 1999. He served his country in the United States Army from 1965-1967. Tump was an avid golfer-making back to back hole-in-ones on two consecutive days. He enjoyed golf trips with his friends and vacationing with family to Maderia Beach, Florida. He was also a very devoted Michigan Football Fan. His greatest joy by far was his grandchildren. Tump is survived by his wife, Barbara; children: Michael Dingman, Daniel (Angela) Dingman, Blair (Mark) Pancheck; grandchildren: Mackenzie and Mason Pancheck, Tyler and William Dingman; brother, Gerald Dingman; sisters: Dianne (Bernie) Friend, Bonnie Harden; sister-in-law, Nancy (Archie) Fallis; brothers-in-law: Bert (Judy) Winer, Hugh (Pat) Powell and many nieces and nephews. He was preceded in death by his parents; son, Christopher; sisters-in-law: Margaret Powell and Brenda Hoffman. Tump’s family would like to express a very special thank you to Hurley Medical Center Emergency Department staff: Dr. Misemer; Registered Nurses: Lee and Will; the respiratory staff and his special nurse, Holly Johnson. Family would also like to thank Dr. Peddireddy and staff and Dr. Peram and staff at Triumph Cancer Center.